If you're looking for a low priced 2018 flagship phone, Verizon has quite a deal on the LG G7 ThinQ. New subscribers can switch to the nation's largest carrier, or existing subscribers can add a new smartphone line to participate in this offer. Buy the LG G7 ThinQ using Verizon's Device Payment plan and instead of making 24 monthly payments of $31.25, you'll be paying $15.63 a month instead. In other words, the $375 you're saving will be spread out over 24 monthly bill credits. And there is more. Add a second LG G7 ThinQ to your cart and you'll receive an additional $31.25 a month in bill credits over 24 months. That makes the second unit free. Another new line of service is required, and the bill credits may not kick in for one to two billing cycles. If you snap a lot of photos with your phone, the LG V40 ThinQ might be more of interest to you. With three cameras in back and two in front, the LG V40 ThinQ normally is available from Verizon for $979.99 or 24 monthly payments of $40.88. But if you switch from another carrier, or add a new smartphone line, you can buy the phone for $20.42 a month over 24 months. 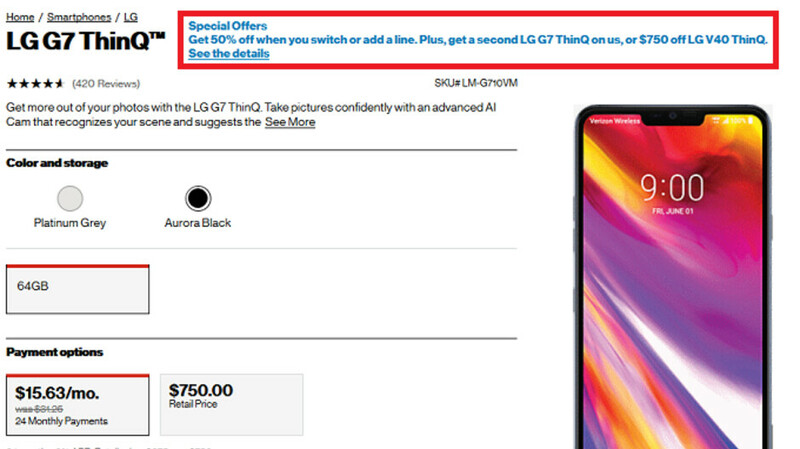 And if you're willing to add a second line, Verizon will take $750 off the price of a second LG V40 ThinQ. That will drop the price to $9.58 a month over 24 months. The deals are available online from the Verizon website for a limited time only.